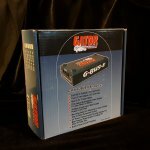 The G-Bus-8-US Pedal Board Power Supply is a one-unit solution for powering and protecting all your effect pedals. 1700 Milliamp Regulated 9V & 18V Multi-Output DC Power Source for Pedals. It gives you 8 - 9V outputs, and 3 - 18V outputs, provides short circuit protection, and is housed in a roadworthy heavy-duty aluminum casing that mounts easily to most pedalboards. Includes 9 - 24" patch cables.